By: James Lin, GLIDE's Co-Director of Human Resources and Organizational Integration. He arrived at GLIDE just before Thanksgiving in 2004. In my immigrant family in the 1970’s, Thanksgiving was probably the holiday that was the easiest to understand. My mother, who had lived through the bombing and occupation of her home cities in China during WWII, understood the gratitude of having family together and safe. My father, a Depression baby, appreciated the celebration of abundance that made possible enough food on the table to share with those you love. Only my brother really ever mastered the whole turkey thing, but we got the essentials down, and I could eat canned cranberry sauce year-round. In just a few hours, early on Thanksgiving morning, over 400 volunteers will start arriving to carve turkeys and plate potatoes and vegetables, and they join GLIDE’s commitment to making Thanksgiving a holiday when anyone can find a safe place at the table. 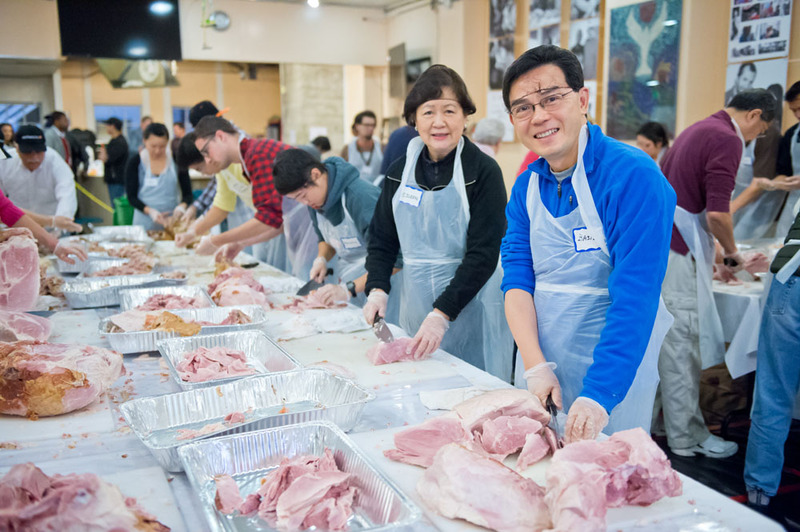 Like many of you, we at GLIDE and our partners have been getting ready for weeks: our friends from AAA, the Morongo Band of Mission Indians, and Mayor Ed Lee himself, sent hundreds of turkeys, and volunteers have been chopping and peeling in our prep room for over a week now. 1500 pounds of potatoes! It takes a bit of planning and a lot of hands to make dinner for five thousand people. 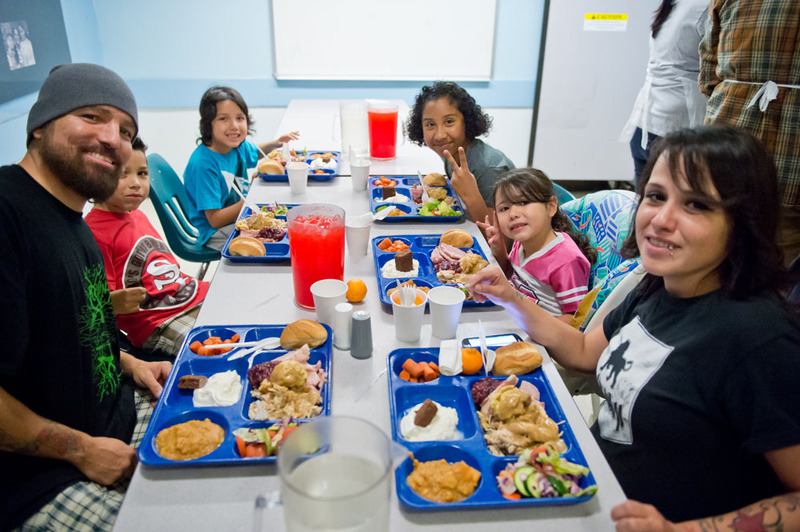 Tomorrow there will be whole families arriving to volunteer together, individuals who have decided to spend their Thanksgiving making sure that no one else eats alone, and both guests and volunteers alike who come and celebrate a holiday that has always been about extending our concept of family to other people in our communities. There will be music, lots of laughter, and the satisfaction of hard work that makes a difference. 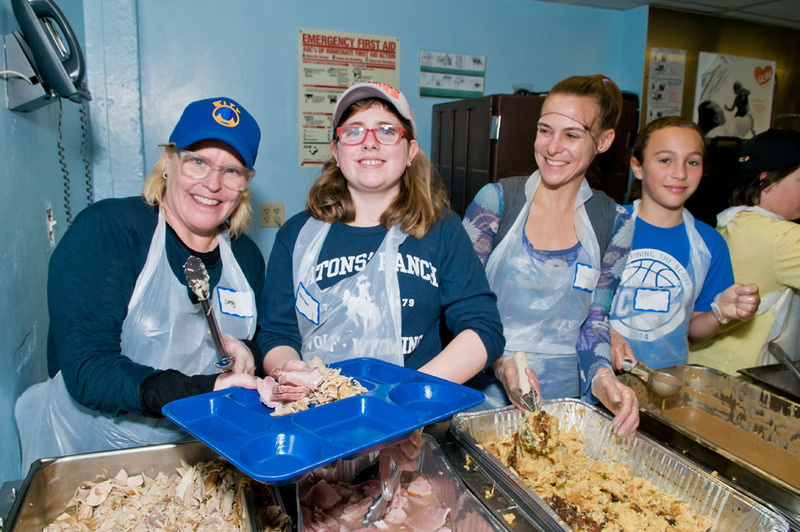 Our volunteer shifts for holiday events often fill up within hours of being posted, but if you didn’t get a chance to volunteer with us this season, consider this: every day here at 330 Ellis Street is at its core a Thanksgiving day, when folks come together to share a meal and make sure no one has to be alone or afraid. Some of our daily guests are homeless, some are families who want to make sure their children have complete nutritious food that they couldn’t otherwise afford, and some are working folks who are just going to be able to pay rent if they eat with us and save on their grocery bill. These are the folks who walk through our doors every morning. In January, when it’s time to pack away the menorah and recycle all that wrapping paper, we will need you to help us keep our year-round promise to the people of San Francisco, that GLIDE will be here for people who need a meal or a place to belong, on Thanksgiving Day and every day.